The family of Daniel Singh, who was murdered 18 years ago, is expecting to see progress with the investigation after the alleged perpetrator was arrested after evading police since 2000. 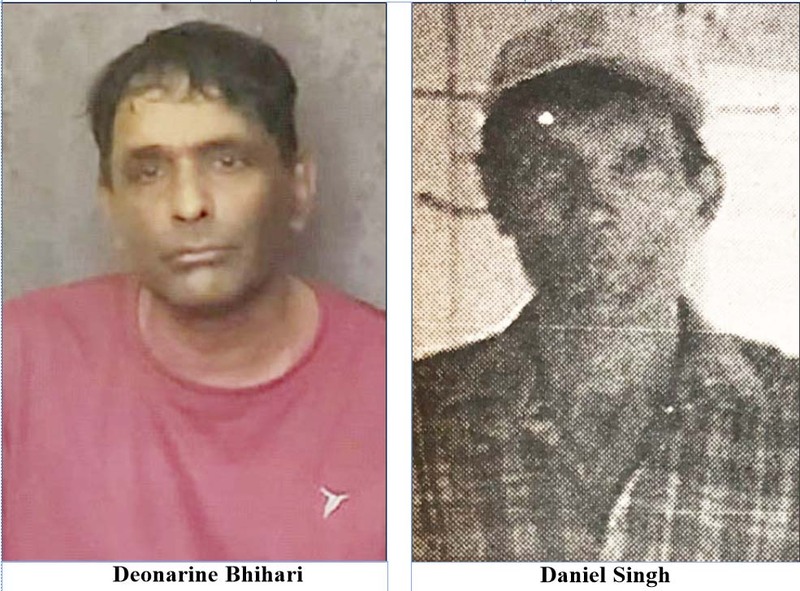 Police confirmed yesterday that the prime suspect in the murder of Singh, Deonarine Bhihari was arrested sometime on Saturday night at his sister’s residence in Enmore, East Coast Demerara. According to information reaching this newspaper, the man has evaded police for nearly 18 years and was hiding in Venezuela for some time. As a result of the current situation in Venezuela the man reportedly returned to the country sometime this year. Singh’s relatives related to Stabroek News that they were made aware of the man’s presence in the country and had been working with the police as well as lawyers on apprehending the man. They were finally able to swoop down and arrest him on Saturday. He is currently in police custody assisting with the investigations. On May 21, 2000, 49-year-old Singh, a single father of four, from Hope West, Enmore, was chopped to death by a cutlass-wielding man. The man had also hacked three of Singh’s dogs to death and injured another one while three of his children stood and watched on in horror. One of Singh’s sons, Vishal, who was 12 at the time of the incident, had told this newspaper that around 5 am he and his younger brother were awoken by a loud commotions. The boy had related that when he peeked through the window he saw the attacker, wearing just his underwear, hacking away with a cutlass at his father. After brutally attacking Singh, the man turned his attention to the three dogs that were barking in the yard and killed them. Singh’s daughter, Nalini, who also witnessed the attack, was screaming at the man before he started to attack her too. The girl was chopped on her hands twice and only managed to escape from more serious injuries after she and her siblings ran to a bedroom and locked the door. The attacker fled from the house, scaled a fence and escaped. Neighbours who were awakened by the loud noise rushed to the house where they found Singh with several chops about his body on the ground, the three dead dogs and the children locked in their room. They were then rushed to the hospital where Nalini was treated for her wounds. Singh was also taken to the hospital but did not regain consciousness and died several days after.